The square was named in honour of Aristide Boucicaut, who was the creator of the famous and first department store in Paris called Le Bon Marche, which is located opposite this garden, and along with numerous trees and park benches, there is a childrens playground plus a statue dedicated to his wife and her friend. 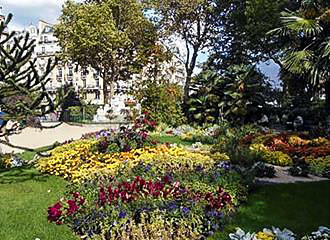 The Square Boucicaut was first laid out towards the end of the 1800s and included different ornamental vases that unfortunately have long since gone, but many different species of trees were also planted, including rare species such as Austrian pines, alders, palms and Judas trees. Today there are still more than a hundred different trees, some of them well over the century old, and there is a wide walkway that has lawns and flowerbeds either side, plus a pond was more recently installed to promote additional wildlife and biodiversity. And there are also plenty of park benches where you can sit and relax in the shade of the trees, in the sun, or while watching your children playing happily in the sandpit and in the childrens playground. This square in Paris was named after Aristide Boucicaut, and is situated by the Rue de Sevres and the Boulevard Raspail, which looks over to the famous and oldest department store in France called Le Bon Marche, which this gentleman first created. And in fact, although now run by the LVMH group, the building still retains some of its original features including the metal frame constructed by Gustave Eiffel, who built the Eiffel Tower, and Le Bon Marche is classed as an historical monument, yet is still an impressive department store, even with concierge services. 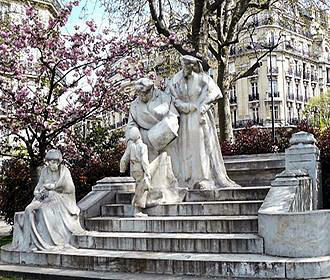 But getting back to the Square Boucicaut, you will also find a white marble statue located within it, which was sculpted by the artist Paul Moreau-Vauthier in 1914, and this was designed to depict the charitable actions of the wife of Aristide Boucicaut, Madame Boucicaut, along with her friend Baroness Hirsch. The Square Boucicaut is open from 8am on weekdays and 9am at weekends, yet closing times vary depending upon the time of year, from as early as 5.30pm during winter months to as late as 9pm in summer. But unfortunately some parts of this garden in Paris are not easily accessible to the disabled, such as getting up close to the statue for instance, however, you may be pleased to know that there is a water point for filling up the much need water bottles during the hot summers days. 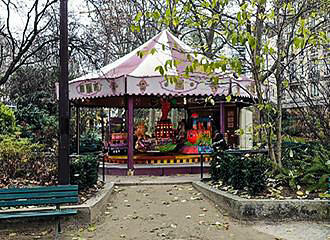 And you will find this square located within the 7th Arrondissement, with the nearest Metro station actually located at the Square Boucicaut itself, so this means that it is very easy to get to via public transport in Paris, with the Sevres - Babylone stop serving lines 10 and 12, plus there are three Velib stations also located close by.